Optional tours are available from most ports for an additional charge. 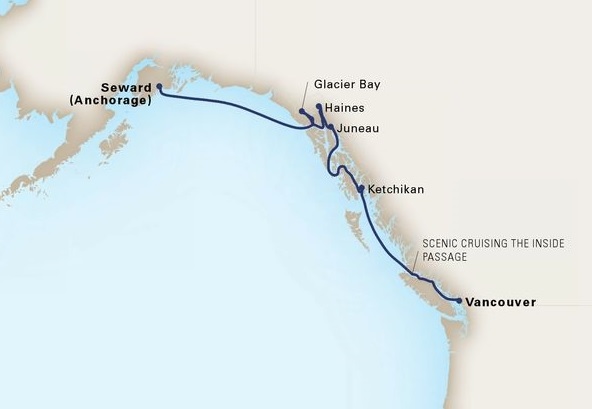 One of Southcentral Alaska’s oldest communities, Seward is ground zero for the Klondike Gold Rush's Iditarod National Historic Trail, a dogsled route that connected the Kenai Peninsula’s ice-free port with Nome during frontier-era winters. Though the modern race makes a ceremonial start in Anchorage, it’s inspired by the famous run of 1925, which dashed along parts of this older path. It allowed 20 mushers to carry urgently needed diphtheria vaccine more than 1,000 kilometers (621 miles) in just over 127 hours. Natives and explorers from Russia, Britain and the United States all frequented this area before Seward’s official founding in 1903. The early settlement included a colorful neighborhood known as Homebrew Alley which was erased by a 9.2-magnitude megathrust earthquake—the second most powerful ever recorded—which dropped the shoreline nearly six feet in 1964. Today this mellow town welcomes visitors to Resurrection Bay and Kenai Fjords National Park, not to mention the 204-kilometer (127-mile) Seward Highway—honored as an All-American Road—stretching north to Anchorage. In town, favorite stops remain the Alaska SeaLife Center, a research aquarium open to the public, and the steep, stony 920-meter (3,018-foot) Mount Marathon, which hosts one of America’s oldest footraces each Fourth of July. Frosted crags descend into mossy forests and a 457-meter-deep (1,500-foot-deep) fjord at this World Heritage Site, which is also one of the planet’s largest biosphere reserves. Stone, ice and water continue to collide, sculpting a dramatic landscape that is the crown jewel of southeastern Alaska’s natural wonders. The area’s first European explorer missed it all—but with good reason. When Captain George Vancouver sailed here in 1794, a vast shield of ice, more than 1,200 meters (3,937 feet) thick, dominated the area. 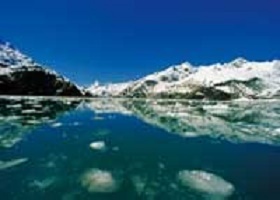 In one of the fastest retreats on record, the glaciers shrank back 105 kilometers (65 miles) by 1916. The formerly glacier-squashed land is rebounding now, rising 30 millimeters (1.18 inches) each year. Visitors can observe this rebirth: A spruce-hemlock rain forest has sprouted near the mouth of Glacier Bay. Farther north, the more recently exposed land shows sharper edges and thinner vegetation. 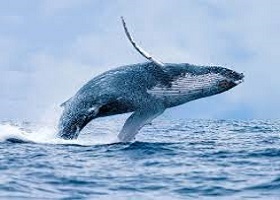 Still, it’s enough to encourage the return of wildlife, from bald eagles to bears, moose and humpback whales. 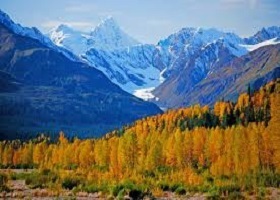 Haines is one of the most popular Alaska cruise ports and one of the best places for hiking, fishing and wildlife viewing, especially bald eagles. Within the Haines city limits Fort William H. Seward is a nationally recognized historic landmark, with some of its structures open to the public. Other cultural offerings in Haines include the Alaska Indian Arts Center where traditional craftsmen offer demonstrations of their work, the Sheldon Museum & Cultural Center where local Tlingit people are featured, the Hammer Museum, dedicated to the history of the hammer and the Tsirku Canning Company Museum with memories of Haines’ salmon canneries. 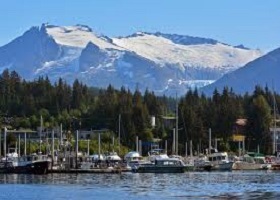 "Juneau, Alaska may well be the most remote, most beautiful and strangest state capital in the United States. Surrounded by water, forest and mountain sights, visitors seeking things to do in Juneau indoors and outdoors can hike a glacier, eat fresh-caught fish on a seaside patio and tour a grand capitol building all in one day. The city itself is pleasant, but the real highlight of a visit to Juneau is tracking down some wildlife. You can hike up Mount Roberts to chance upon wild deer and bald eagles. 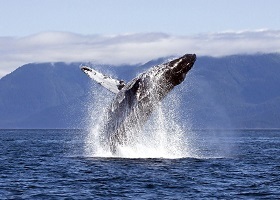 Most sightseeing and whale-watching tours head north to Auke Bay—bring a good pair of binoculars to get the best view of these majestic and surprisingly graceful creatures. If you prefer land mammals, catch a floatplane to a nearby wildlife reserve such as Chichagof or Admiralty Island to spy some bears lolling around. The sleepy, misty city of around 32,000—mostly fishermen and small-business owners—has a frontier town vibe, but welcomes more than a million visitors each summer to its natural attractions, cementing Juneau as Alaska’s number-one tourist destination. " "Alaska’s “First City” of Ketchikan is so named because it’s the first major landfall for most cruisers as they enter the picturesque fjords of the Inside Passage, where the town clings to the banks of the Tongass Narrows, flanked by green forests nurtured by abundant rain. Ketchikan has long been an important hub of the salmon-fishing and -packing industries—visitors can try their luck on a sportfishing excursion or simply savor the fresh seafood at one of the local restaurants. It is also one of the best spots along the Inside Passage to explore the rich cultural sights of Native Alaskan nations like the Tlingit, Haida and Tsimshian. You can see intricately carved totem poles at the Totem Heritage Center and Totem Bight State Park, while the attractions of Saxman Village just outside of Ketchikan offers the chance to see Tlingit culture in action, with working carvers and a dance show in the clan house. 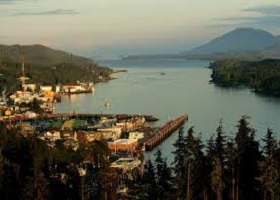 And leave time to explore the sights in the town itself, including historic Creek Street, a boardwalk built over the Ketchikan Creek, where you can shop for souvenirs, smoked salmon and local art, while exploring gold rush­–era tourist attractions like Dolly’s House Museum. " "Alaska’s Inside Passage is a protected network of waterways that wind through glacier-cut fjords and lush temperate rain forests along the rugged coast of Southeast Alaska. Arguably one of the greatest cruising routes in the world, the Inside Passage stretches through stunning landscapes, from Misty Fjords National Monument to famed Glacier Bay National Park & Preserve. Sailing the Inside Passage offers opportunities to spot some of Alaska’s most iconic wildlife, with humpback whales and orca plying the bountiful waters alongside the ships, bald eagles soaring overhead and brown bears lumbering on the shoreline. Numerous ports along the way recount Alaska’s colorful history. In Sitka, an onion-domed church marks Russia’s onetime foothold in the Americas; Ketchikan provides a glimpse of the Native Alaskan experience, with historic totem poles and native-arts galleries; and the legendary town center of Skagway bustles as it did at the turn of the 19th century, when it served as the rowdy Wild West gateway to the Klondike Gold Rush. " Vancouver’s location at the mouth of the Fraser River and on the waterways of the Strait of Georgia, Howe Sound, Burrard Inlet and all their tributaries makes this busy seaport an easy place for meeting. It is one of Canada’s most populated, most ethnically diverse cities that is a popular filming location. Visit the interesting neighborhoods of Gastown, Granville Island and Chinatown. 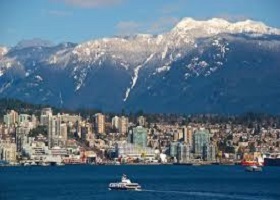 Walk across the Capilano Suspension Bridge and stroll through Stanley Park. See the Vancouver Art Gallery and the Museum of Anthropology. There is an amazing variety of things to see and do here. © Cruisebooking.in. All Right Reserved.